BROWNSVILLE, Texas – The U.S. Army Corps of Engineers celebrated Friday, March 15, the completion of the decommissioning and dismantling of the historic STURGIS vessel that was formerly the world’s first floating nuclear power plant. This was marked by the final section of the former vessel being segmented and brought ashore for processing and recycling at the International Shipbreaking facility in the Port of Brownsville. The Army converted the STURGIS from a World War II Liberty Ship to a mobile nuclear plant in the1960s. It was deactivated and partially decommissioned in 1976 and subsequently safely stored in the James River Reserve Fleet at Joint Base Langley Eustis, Virginia until being towed to Galveston, Texas in 2015 for its final decommissioning and dismantling. From 2015 to 2018, the U.S. Army Corps of Engineers and it prime contractor, APTIM Federal Services, implemented the challenging and complex efforts to decommission the MH-1A – the deactivated nuclear reactor that was onboard the STURGIS vessel. The STURGIS has had a unique life since first being built in the 1940’s as a World War II Liberty Ship, the SS Charles H. Cugle. After serving in World War II, the ship was converted into the world’s first floating nuclear plant in the 1960’s, housing the MH-1A nuclear reactor. Before being shut down in 1976, the STURGIS’ nuclear reactor was used to generate electricity for military and civilian use in the Panama Canal. The reactor was de-fueled, decontaminated for long-term storage, and sealed before being towed to the James River Reserve Fleet at Joint Base Langley Eustis, Virginia; where it was stored and maintained since 1978, except for times of periodic dry dock maintenance. In 2012, its formal decommissioning effort began as part of a broader effort to decommission the Army’s retired nuclear reactors through the Army Deactivated Nuclear Power Plant Program. After award of the decommissioning project contract, the STURGIS was ultimately towed 1,750 miles from Virginia to Galveston, Texas in April 2015 for its final decommissioning. That decommissioning effort was completed summer 2018 summer with the safe removal of all components of the deactivated nuclear reactor and associated radioactive waste that was formerly aboard the STURGIS. The vessel was towed to Brownsville, Texas in September 2018 for final traditional shipbreaking, which was completed in March 2019. 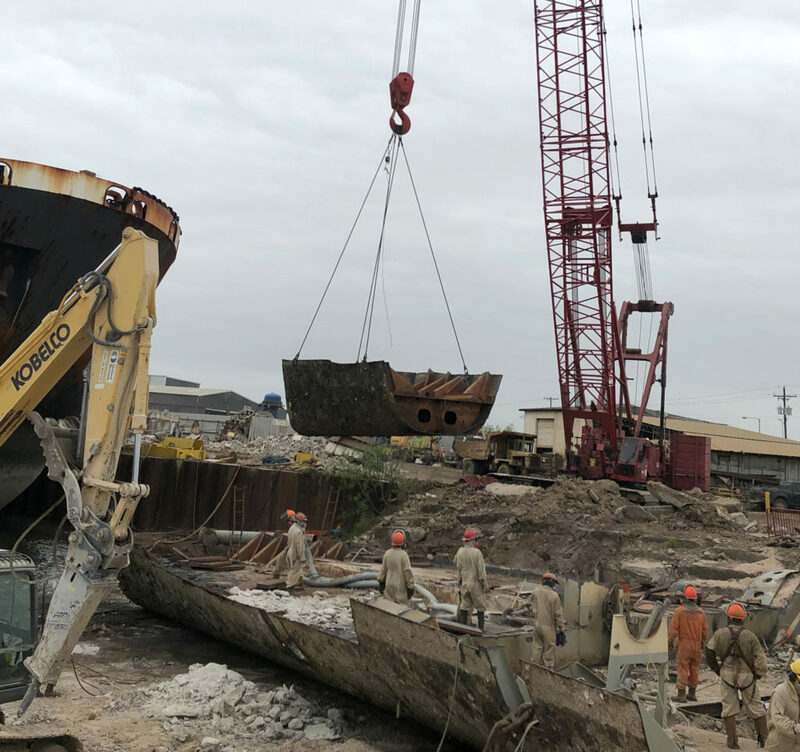 The final piece of the STURGIS is lifted from the Brownsville Ship Channel at the International Shipbreaking, Ltd yard at the Port of Brownsville. U.S. Army Corps of Engineers officials estimate approximately 5,800 tons of steel and other assorted metals from the ship will have been recycled (Photo courtesy USACE).